​​Since 1982, we have taken pride in our honesty and professional approach to the needs of each of our customers. Our technicians undergo rigorous in-house training to acquire experience long before they serve our customers, and only after their training is complete by attaining the Chimney Safety Institute of America Certified Chimney Sweep Credential. The CSIA not only requires technicians to continue training and learning new skills as the industry and safety codes evolve in order to keep their certification, which is why each technician must test every three years. The CSIA also requires technicians to sign and adhere to the Chimney Sweep Code of Ethics to further protect homeowners with an emphasis on honesty and professionalism. We are recognized as an A+ rated business by the Better Business Bureau. Our company is licensed and registered with the State of Connecticut and fully insured. 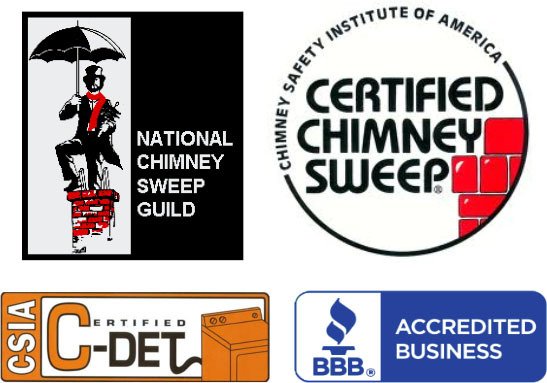 ​All of our technicians are certified by the Chimney Safety Institute of America, and we are proud members of the National Chimney Sweep Guild. We are committed to chimney and fire safety, as well as education, integrity, and ethical business practices. All of our technicians have completed Chimney Physics: Diagnosis and resolution of chimney performance problems, solving air pressure problems, identifying the symptoms of indoor air pollutants, and determining combustion air requirements for vented appliances. All of our technicians have attended numerous seminars and training sessions relating to: Indoor air quality, system venting requirements and specification, chimney draft/flow and performance. Graduate Advanced Masonry Restoration School- Southwestern Technical College, Pipestone, Minnesota.